I am a regular Confederate soldier, and have served in the Confederate army four years … I could prove that I am a regular Confederate soldier, and I hope to die for the Confederate cause. Clarke‘s last remarks were a protest against Kentucky’s military government. Having captured Clarke just three days before, it refused him prisoner-of-war status; regarding him rather as a franc-tireur, it gave him a pro forma secret trial even while throwing up the gallows for the preordained hanging. This border region between North and South had seen bitter guerrilla war. As one indicator: the Northern effort in the Bluegrass State to suppress Confederate irregulars had been led by a general who earned the nickname “Butcher of Kentucky” for his ruthless exertions. It was during this time that stories began circulating of a daring female commando, a “she-devil in pantaloons,” and the picturesque character — perfectly calibrated to twist the Butcher’s tail — seized popular imagination and moved newspapers. 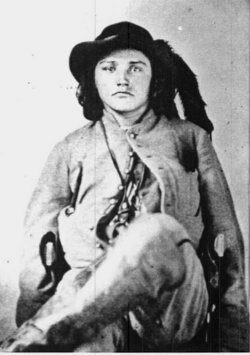 While the honor is disputed by another Kentucky irregular hanged later in 1865, this “Sue Mundy” (or Munday) character soon came to be identified with the androgynous, just-old-enough-for-his-riding-license Clarke. A captured Clarke would eventually complain that “he was not guilty for one-tenth of the outrages that he had been charged with and that the Louisville Journal had done him a great injustice.” Maybe he’d never heard that there’s no such thing as bad publicity. The publicity this afternoon, of course, was of the very worst variety, albeit not exactly inimical to the celebrity racket. Several historical markers in Kentucky still commemorate that notorious career.